Petal Pushers is a full service florist specializing in fresh cut floral arrangements for all occasions. We are located adjacent to the USC Campus and serve the Greater Los Angeles and Orange County areas. The forte of Petal Pushers includes specialty custom floral arranging for weddings, formal parties, and corporate events. From five to five thousand attendees, no event is too small or too large. Our florists use only Premium Quality fresh cut flowers guaranteed to last. 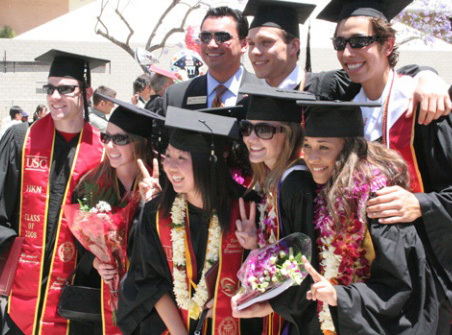 We provided the highest quality products and service to tens of thousands of Graduates! Call us Toll Free Tel: 1-800-787-1983 to place an order for your GRADUATE ORCHID LEIS. Petal Pushers is committed to providing a new and improved value added cost conscious method of purchasing flowers. Where traditional florists have ready made arrangements at varying price points, we are just the opposite, we custom design your arrangement based on your intended message, color combination, size, style and budget. We are committed to the satisfaction of our customers and look forward to developing a long term relationship with each and every one of you and the ultimate recipient of your order as well, we view each order as an opportunity to market our services and we have found maintaining a consistent level of quality and service has been a relatively simplified method to nurture future relationships. We dont ship flowers, because if you have ever received any flowers by mail then you know flowers dont ship well. We also dont utilize any of the wire services as we maintain very strict quality controls that cannot be monitored or maintained at an outsourced florist.